Mara Dyer wakes up in a hospital room, but can't recall how or what happened that got her in there. It's not until she asks about her friends that she realizes that they aren't there in her hospital room because they're dead. They died in a tragic building collapse, but somehow Mara survived with no memory of the accident. The loss of her two friends and boyfriend is too much for a young girl to handle, so her parents make the choice to move the entire family from Rhode Island to Florida to start over again. Of course, Mara can't seem to fit into her new school, and it's only the alluring Noah who seems to find her intriguing. When Mara's memory slowly is revealed, with flashes of her dead friends appearing before her in unexpected places, the thriller of establishing what is real and what isn't becomes a ride into the dark underbelly of how to control the subconscious. I'll be honest. I love a good book cover and that's what made me interested in this one. The publisher had more than enough copies to disperse at the Book Blogger Convention at BEA in New York in May, so I snagged a copy to read for the plane ride home. This is a story in which telling you too much of what happens spoils it. Suffice it to say that while dark, it is an intriguing study of how difficult it can be to control your thoughts. Michelle Hodkin's debut novel was an enjoyable and quick read and there are sparkling moments of surprising humor that made me laugh out loud appreciatively for the author's wit. It is a multi-layered mystery, with no end to the paranormal-esque experiences in which Mara finds herself in. She and her family were genuinely interesting and refreshing, and the side story of her family hovered in the background, keeping me wondering when, or if, it would pounce out. With every chapter ending in a mini-cliffhanger, it hooked me in and was hard to put down. Unfortunately, there was only one pestering aspect which held me back from truly loving it. Noah, the young boy in which Mara falls in loves with, is the typical mysterious schoolboy who seems to be wise beyond his years, is nonchalantly obnoxious, and never seems unsettled by anything. While I know some people are old souls, I found myself wanting Noah to just be a kid for once. Although I was curious to see what happened with his character, most situations that he and Mara encountered frustrated me. Noah could have been a worldly man in his forties, if you didn't already know that he was a teenager. But, even though I wanted his character to be a bit more not cool, not calm, and not collected about all of the satisfyingly shocking revelations, I am eager to see where next this story goes in book two. This book will be released in September 2011, but is available for pre-order now. Michelle Hodkin grew up in South Florida, went to college in New York, and attended law school in Michigan. When she isn't writing, she can usually be found prying strange objects from the jaws of one of her three pets. This is her first novel. Click here to visit the author on her website. Click here to follow the author her blog. Click here to follow the author on Twitter. This novel sounds intriguing. I might try it. I agree - that is one fabulous cover. I think the book sounds good even with your little frustration. Paulia - Intriguing, it definitely is. I hope you enjoy! bermudaonion - The cover is so artistic, I love it. And yes, even with that one nagging piece for me, overall it was a good read, and I look forward to the next installment of this series. I am definitely pre-ordering this one. I can't wait to read it! Thanks for the review. I love books that keep you racing ahead and keep you guessing, so it sounds like this one might be the book for me. Aside from the little niggle that you had with one of the characters, it sounds like you really did enjoy this one, which is good enough recommendation for me. This was a great review, Natalie! I am glad you loved it! It seems like you're half and half here. I can see why you would get frustrated with the love interest but I can't wait to read this one myself! Thanks for the honest review! Yeah, I'm with you on the cover love! Very nice review -- I too would probably be a bit frustrated with Noah but I'm a sucker for darker stories like this. Kristina - I love to pre-order! Looking forward to your thoughts once you read it! Veens - Definitely give it a try, it's a very enjoyable read! Amber - I'm a little more than half and half on this one; I liked the story, but Noah was just so...perfect, you know? I mean, he's a teenager! I don't remember guys like that in my high school, lol. But, other than that, I really enjoyed the story. Maybe I'm more 80/20? :) It's just me! Ooh sounds creepy! I love hen a book has cliff hangers for their chapters so that I'm hooked on reading more! Jenny - Definitely has the cliffhanger per chapter mastered! It was very hard to put down! I love this cover and cannot wait until it comes out in September. I'll even take the mysterious boy. 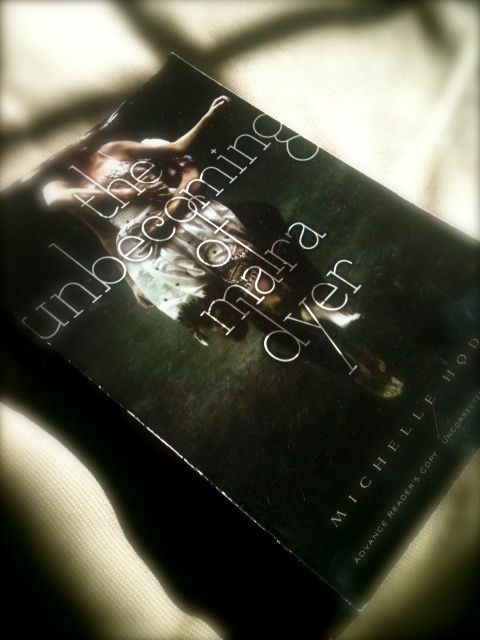 Definitely worth reading and finding out more about Mara and Noah's lives. Ready to read the next book in this series.